GOLF LEGEND BABE ZAHARIS PICTURED ON 1976 TOURNAMENT BUTTON. 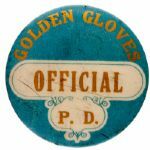 NAVY CIRCA 1930s FOR FOOTBALL GAME BUTTON WITH TWO RIBBONS. ARMY 1930s BUTTON FOR FOOTBALL GAME. WASHINGTON REDSKINS FROM 1960s FOOTBALL TEAM SET LITHO BUTTON. SONNY LISTON FIGHT BUTTON FROM 1964 MATCH WITH CASSIUS CLAY LATER KNOWN AS MUHAMMED ALI. METS FROM 1960s BASEBALL TEAM SET LITHO BUTTON. L.A. DODGERS FROM 1960s BASEBALL TEAM SET LITHO BUTTON. METS 1986 WORLD CHAMPIONS BASEBALL BUTTON. CATCH THE OLYMPICS WITH WEYERHAEUSER CIRCA 1984 LITHO BUTTON. CONNORS VS NAVRATILOVA BATTLE OF CHAMPIONS 1992 TENNIS BUTTON. “SOUTH SIDE” 1930s FOOTBALL DESIGN FIGURAL BUTTON. “THE HARD WAY BACK – TYSON VS. STEWART” BOXING BUTTON. 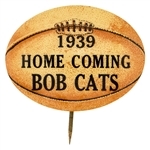 “1939 HOME COMING BOB CATS” FOOTBALL DESIGN OVAL SPORTS BUTTON. JEWISH INTERNATIONAL SPORTS EVENT BUTTON. 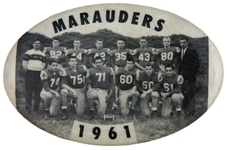 “MARAUDERS 1961” HIGH SCHOOL FOOTBALL TEAM OVAL BUTTON. WORLD WRESTLING FEDERATION CELEBRITY “ELIZABETH” BUTTON. 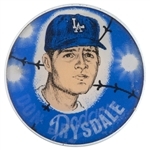 “DON DRYSDALE / LA DODGERS” 1964 FLICKER – FLASHER BASEBALL BUTTON. “TOKYO FISHING SHOW” LARGE CLIP ON 1981 METAL BADGE. STAFF BUTTON FROM 1994 OAKMONT U.S. OPEN GOLF TOURNAMENT. RARE “PRESS”LARGE BUTTON FOR 103RD NATIONAL ROWING CHAMPIONSHIPS” SPORTS BUTTON. “NUDIST CONTEST” 1930s APPARENT CONTESTANTS BUTTON. “NEW YORK COSMOS ‘KICKS CLUB’” 1970-1985 SOCCER BUTTON. PITTSBURGH “CITY OF CHAMPIONS” STEELERS, PIRATES, PENGUINS WINNING YEARS SPORTS BUTTON. “AMERICAN BOWLING CONGRESS” NYC 1937 “37TH INTERNATIONAL TOURNAMENT” OVAL LITHO BUTTON. “FOREMAN-COONEY / JAN. 15, 1990 / THE PREACHER AND THE PUNCHER” BOXING BUTTON. 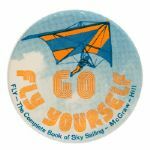 “NEW YORK GIANTS” 1950s STADIUM SOUVENIR BUTTON WITH METAL CHARM AND RIBBONS. “GREEN SOX - CAPTAIN” BASEBALL LITHO BUTTON FROM 1930s SET. “GREEN SOX – FIRST BASE” BASEBALL LITHO BUTTON FROM 1930s SET. 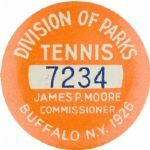 “SPORTS CLINIC WFIL / TOM MOOREHEAD / DON KELLETT” LATE 1940s SPORTS RADIO ANNOUNCERS BUTTON. “NBC SPORTS 1985” IN HOUSE BASEBALL PROMO BUTTON PAIR FOR AMERICAN LEAGUE EAST AND WEST CHAMPIONSHIP SERIES. “NATIONAL GIRLS BASKETBALL 1938 A.A.U. CHAMPIONSHIP” WICHITA, KANSAS BUTTON. OLYMPIC & WORLD CHAMPION SKATER “JACQUELINE DU BIEF – ICE CAPADES” BUTTON. “BELLIES ARE FOR DANCING – LEBWA” BUTTON LIKELY ISSUED IN 1999 BY “LEWBA” (LEBANSES WOMEN’S AWAKENING). IN HOUSE “ABC SPORTS PGA 1977” GOLF BUTTON. “METS” BASEBALL BUTTON WITH GREASE PENCIL NOTATION. 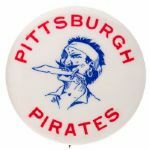 “PITTSBURGH PIRATES” CIRCA 1960s BASEBALL BUTTON. “PITTSBURGH PIRATES” BASEBALL BUTTON WITH GREASE PENCIL NOTATION. NEAT 1930s FIGURAL BASKETBALL BUTTON WITH INITIAL “N”. NEW YORK “YANKEES” BASEBALL BUTTON WITH GREASE PENCIL NOTATION. ROCKY GRAZIANO “K.O. CARELESSNESS” WITH GREASE PENCIL NOTATION BOXING BUTTON. “TYSON VS STEWART – THE HARD WAY BACK” 1990 TRUMP PLAZA BOXING BUTTON PAIR. INDIANAPOLIS RACE PHOTO ON 1936 AMERICAN BOWLING CONGRESS TOURNAMENT BUTTON. “’ON TO VICTORY’” BUTTON FOR 1942 MINNEAPOLIS AQUATENNIAL.